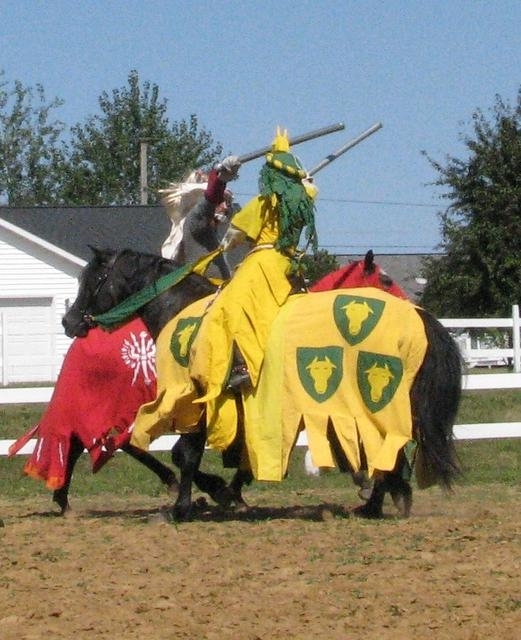 Horses covered in cloth are colorful. This can be as simple as covering your plaid saddle blanket with fabric more typically found in period. 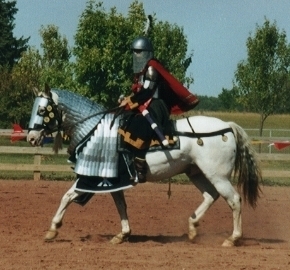 Or it can be as complex as making a medieval saddle, armor, and all the fittings. And there are lots of options in between. The important thing is to decide on a particular culture and time period, and then study the art history from that time. Fortunately, artists were very happy to use horses as models, so there are plenty of examples to work from. This beautiful pair is Viscountess Kassandra and Loki as 12th Century Byzantine heavy cavalry. Here is an easy outfit you can make. Fabric covers the saddle cloth. A breast collar and breeching are made of fabric with a scalloped pattern and shiny spots for decoration. They are tied to the saddle rigging and have support straps over the withers and croup to hold them in place. 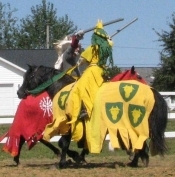 The reins have the same pattern cloth covering. 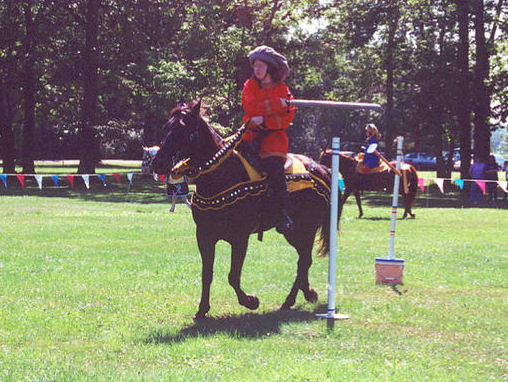 The rider wears a simple T-tunic with a bag hat covering her riding helmet. 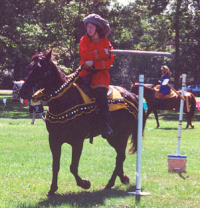 For a quick and easy way to dress up your horse's barding, check out Easy Covered Reins.